– E-Cigarettes Contain Less Nicotine. The nicotine intake per puff is 26.8 to 43.2 micrograms in e-cigarettes, compared to the 1.08 milligrams of a single tobacco cigarette; that means you would have to inhale 23 to 35 times on an e-cigarette to intake the same amount of nicotine as a regular tobacco cigarette (which, for reference, lasts about 7 to 12 puffs). – E-Cigarettes Have Less Carcinogens. By now, you may have heard that the FDA found traces of diethylene glycol, a highly toxic chemical, in one Smoking Everywhere brand e-cigarette refillable cartridge. Although there are risks of inhaling diethylene glycol while using less-refined and cheaper nicotine, diethylene glycol is used in tobacco processing and is not used to manufacture e-cigarette cartridge refills. However, the FDA found traces of nitrosamines, a tobacco-related carcinogen, in e-cigarettes. 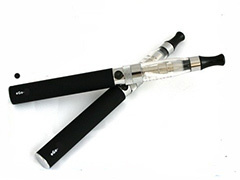 E-cigarettes contained nitrosamines in lesser doses than tobacco cigarettes. – E-Cigarettes Help Users Wean Off Smoking. In one study, 50 smokers who switched to Eclipse brand of e-cigarettes saw a dramatic decrease in smoking without experiencing nicotine withdrawal symptoms. Although some participants had an increased concentration of carbon monoxide in their bloodstream, there were otherwise no significant adverse health risks. Another case study followed three individuals who failed to quit smoking multiple times; after using e-cigarettes to eventually quit, all three participants were able to abstain from smoking for at least six months. Although e-cigarettes are an attractive alternative to smoking tobacco cigarettes, more studies and FDA regulations are required to determine the long-term cardiac and pulmonary health effects and safely administer the sale of e-cigarettes.